Welcome to Payments Innovation! In our most recent podcast episode, Chris (Currencycloud) interviewed Bruce Parker (Modo Payments) about what he means when he says payment interoperability. After two decades in the software side of the payments business, Bruce has seen a lot of technology and infrastructure challenges when it comes to managing data in payments… and navigating exchange between systems and networks among all the various participants in the payments ecosystem. At Modo, he’s focused on how payment data gets exchanged—and, in particular, how to achieve interoperability. “What Modo does is connect the dots,” Bruce said. “We connect between the new and the old. The key to interoperability is being able to connect those dots without changing either side. Modo doesn’t change the existing systems. It’s a software solution to this question: How do you turn the data that’s being exchanged into the same format on both sides of the connection? Hint: It doesn’t mean changing everything. “And in our case, we don’t actually think that that’s necessary,” Bruce added. In some cases, it isn’t even possible. “It’s very, very difficult to change payments infrastructure,” he said. Instead of integration, in comes interoperability. “So instead we say, hey look, we’ll build a connection to the system, whether that’s new or old or something in between,” he said. They code to the existing interfaces. So they take data from Bank of America and transform it into a version that can be “read” by PayPal’s API for payouts, for example. That’s what interoperability is. It leaves both sides the same but helps them to share information anyway. It depends on the client for Bruce to determine whether a potential client needs an essential workflow or a more customized system. “So we have a number of different types of systems that we’ve already got connections on,” Bruce said. Leading providers of online payment methods, mobile payment methods, the traditional card acquiring, card issuing, a gift card, loyalty, etc. “That’s generally where the conversation starts. What are we already connected to? And oftentimes people are trying to do the same things,” he observed. Checkouts. Purchase transactions made online, in store, or by mobile. Payouts. How money generally moves—from large businesses to small businesses or consumers. Pay Ins. The reverse of payouts—small businesses or consumers are paying large entities. The first question that Bruce asks is what system they’re using. Banks, merchants, corporations—all use something to generate payment requests or a system to manage payments flow. “So in the checkout environment, that’s pretty straightforward. There are store-oriented systems, either online or physically, that accept payments and process them through the various network connections,” Bruce said. It’s important for the data to be able to travel to and from many different systems. Could this be the precursor to an open source environment—which is more than likely where Europe and the US are headed? In the checkouts environment, Bruce has seen a lot of businesses as providing a democratization of access to different forms of payments. And in payouts, many have made the endpoints for delivery of transactions much more accessible to a whole new audience. Which is hard. Because you need to give secure access to payment data and make sure that it’s usable by somebody on the other side, but they’re probably going about it in a very different way than you are. Which rolls back around to interoperability. “That’s the place where this interoperability demand comes from. Okay, everybody wants to open things up,” Bruce said. But at the same time, they’re all committed to existing systems or existing choices that they’ve made that constrain their ability to do anything they want. “So, we’re here to say we’ll help you connect to pretty well anything that you like, because we’ve redefined what we think payment data is,” Bruce said. Identities. The credentials of who’s participating in the payment. Transaction States. The payment goes through a life cycle: authorization, capture, settlement, and so forth. Accounting. Keeping track of the movement of money all along the chain of interactions. Commercial Data. The who, what, when, and where of purchase and delivery—the commercial context of a payment. “We have built a platform that says, Okay, I’m going to tear apart every piece of payment data that comes my way and put it in these four categories—identities, transaction states, accounting or ledger entries, and commercial data—and I’m going to be able to reassemble it on the other side for whoever else wants it,” Bruce said. In the next few years, the space of interoperability is going to be more and more essential. Because, for one reason, banks aren’t going anywhere and integration often isn’t an option for them. “No matter what horizon you look out over, there will always be a bank, because that’s a definitional participant inside of every economy, developing or developed,” Bruce said. He’s excited about the challenge. “There’s going to be a durable set of opportunities to solve the problem of connecting between old and new,” Bruce said. Contact Bruce Parker at [email protected] or on Twitter at @ModoPayments. 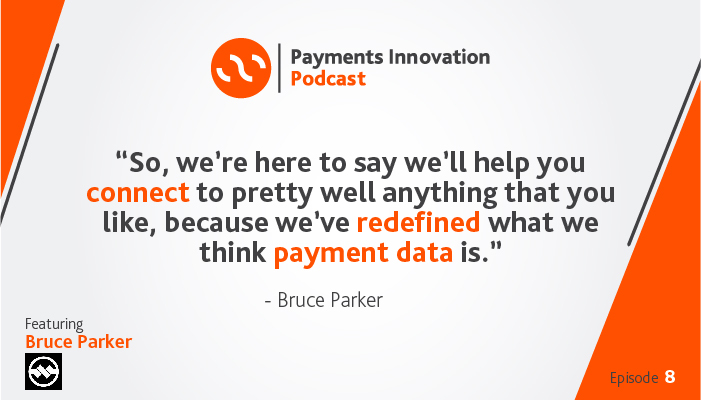 And be sure to listen to all the episodes of Payments Innovation for more insights into the how and why of payment data.